Following up on the delicious fun we’ve had brewing and sharing Requiem for a Pancake, One Love – Imperial Stout Aged in Jamaican Rum Barrels, Rye on Rye on Rye on Rye, Allegro Non Troppo and Paw Paw’s Got a Brand New Bag, our previous Brewhouse One Series releases, we’re excited to announce that it’s almost time to share another new, special beer with you, our friends and neighbors! Beginning life as a double mash imperial stout, Messenger in a Bottle was aged in freshly-emptied J. Rieger’s Kansas City Whiskey barrels for one year and transferred to another set of fresh J. Rieger’s barrels to age for an additional six months before resting on Guatemalan coffee beans roasted by Messenger Coffee Company and whole Madagascar vanilla beans prior to bottling. Pouring jet black with a deep ruby hue around the edges, rich aromas of candied pecan and red apple provided by the coffee, Madagascar vanilla and whiskey notes of sweet, dried fruit, almonds and bitter chocolate mingle in a massive imperial stout. Lingering, drying oak notes from the whiskey barrels serve to punctuate the beer leading to a long lasting finish with notes of fudge, caramel and char. 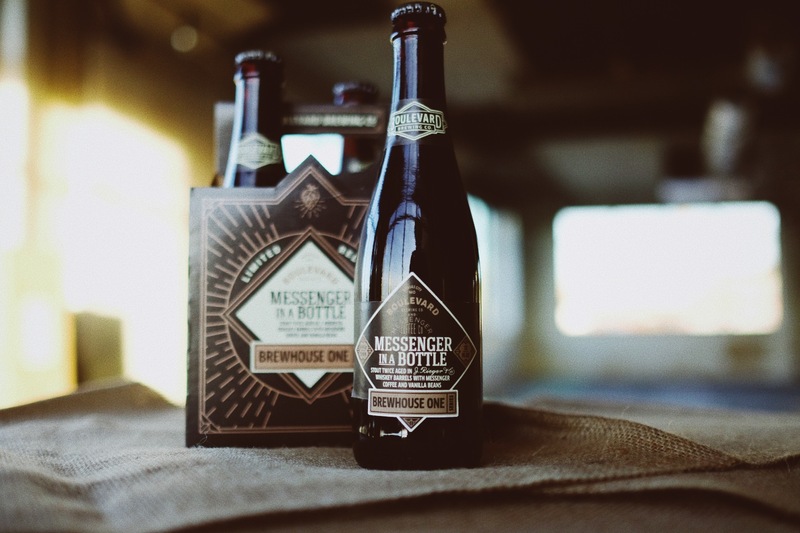 12oz bottles of Messenger in a Bottle will be available exclusively in the Boulevard Tours & Rec Center Gift Shop beginning at 11am on Wednesday, November 21st. Individual bottles will be $12 with four-packs of 12oz bottles available for $40. Draft pours will also be available in our Beer Hall for $5 for 5oz. Operation Breakthrough, our charitable partner for this Brewhouse One Series release, will receive $1 from every 12oz bottle sold to benefit the work they do toward providing a safe, loving and educational environment for children in poverty and empowering families through advocacy, emergency aid and education. For additional details on the public bottle release, please head to our Tours & Rec Center event page.